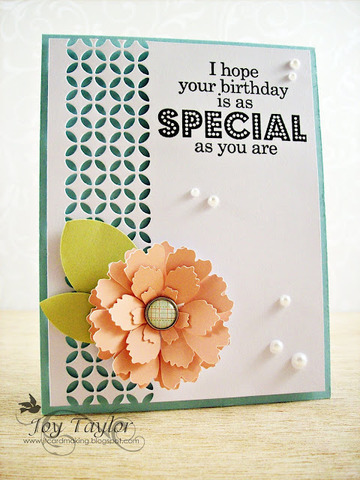 Today I want to share with you a card which I made based on the beautiful inspiration from Case Study Challenge #95. 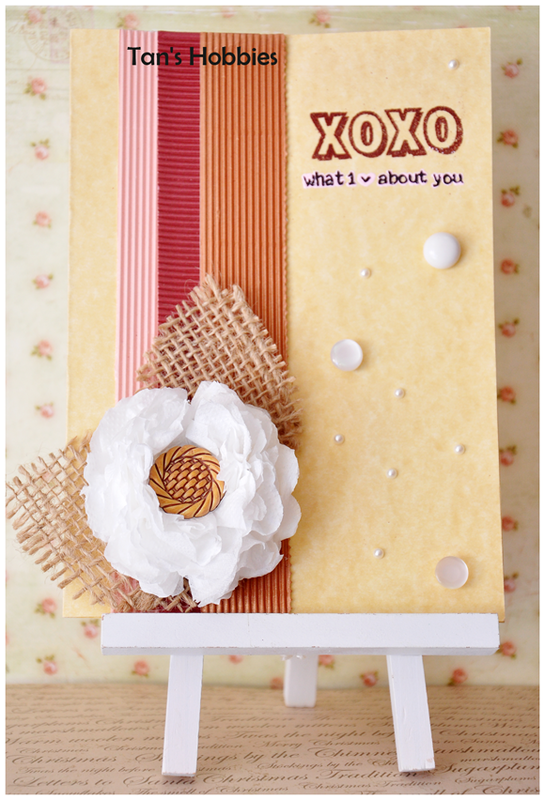 Their June Muse, Joy Taylor, also created a super lovely card based on the picture. 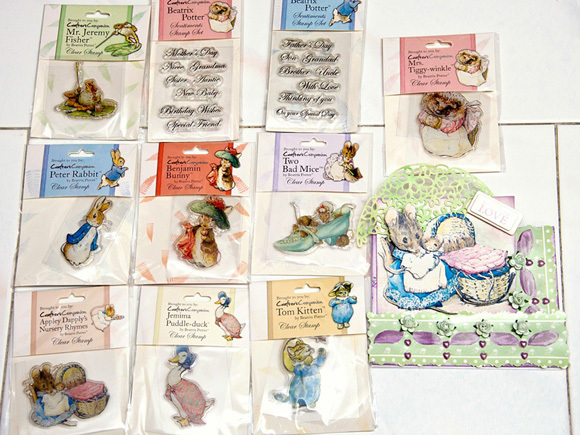 Just visit her blog to see her lovely creations. Super pretty Tan! love tht tissue roll flower and the center button is just perfect.. That burlop in the bg makes it even more special on your card.... love it! Tan this is beautiful and I love the flower made from a tissue roll...love the hessian behind your flower and the button centre..
Beautiful card, love the flower and the button center, gorgeous!!! Hello dear my flower, (^o^)/"""
This is sooooooooooo beautiful card and embellishment flower like YOU !!! I love your white flower and this is very nice volume and cute!!! Also I love your mesh leaves and pearls and bottons. I especially love to use mesh material for something for my card for the future. And ponpon tissue seems very nice to make flowers. I would like to try it myself someday ! (^.^)/"""
oh my this is just perfect...A winner for sure...I love that flower and the burlap behind it.. Loves those burlap leaves - so rustic and pretty! This is just gorgeous! I love your flower! So neat and special! Tan I love this, it is so elegant!!! 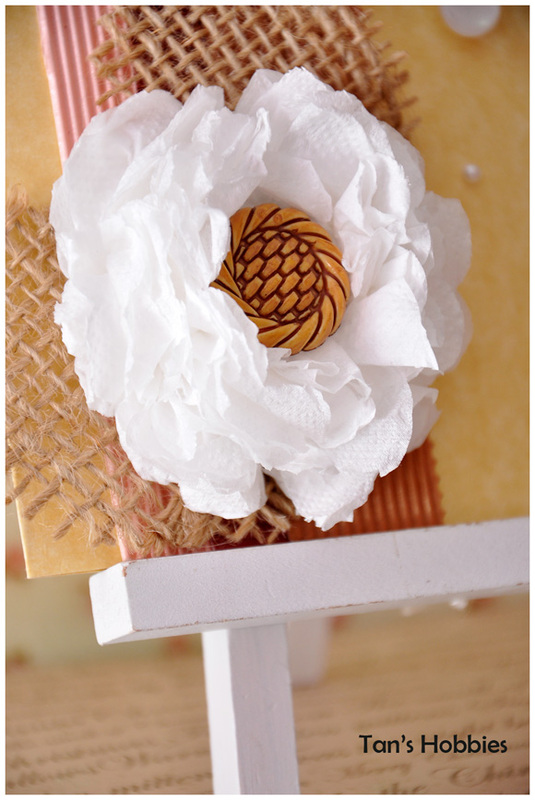 The pom pom flower is amazing, I would love to know how you made them. The burlap is a great touch. excellent Job sweetie. I am so glad you like your birthday gift. Love you mom. Your work is fantastic and your flowers are gorgeous. Nice art work! Very pretty card! So creative! Love the different techniques and materials used! Such beautiful projects and I love love love that handmade flower, so delicate and pretty!